This is a game between two sides who are familiar with each other due to their domestic duties and it is the away side that carries the upper hand heading into this clash. It has been a difficult season for Barcelona, with injuries badly impacting on the team, and they carry an 8-11 record at this stage of the season. There is still a good chance for the Catalonians to make their way into the playoff spots but they need to find form and consistency quickly. Baskonia arrive with an 11-8 record and they know that they have the upper hand against the Catalans in recent Euroleague clashes. Baskonia has won four games in a row against their domestic rivals, which includes two wins in Barcelona, so they know that they have what it takes to win these games. However, if there is a downside to Baskonia at the moment, it is the fact that they have lost their last three games in a row. Barcelona won the league match between these sides earlier in the competition, offering them hope that they can do it in again. That was a 98-92 win after overtime. In the earlier Euroleague clash, Baskonia were trailing by double-digits but they managed to haul it back in time, winning a narrow game 65-62. Rodrigue Beaubois grabbed 19 points in the win while Ante Tomic was the key man for Barcelona, offering 18 points in the loss. Barcelona have had a lot of good play from Tyrese Rice this season, offering 14.7 points per game and an average of 5.3 assists per game. However, Barcelona’s troubles can be seen with the fact that they have scored an average of 72 points per game, which is the lowest in the league. Shane Larkin has been in fine form for Baskonia, offering an average of 13.1 points per game while also offering an average of 6.2 assists per game. Beaubois has offered an average of 12.8 points per game and Johannes Voigtmann has chipped in with an average of 10.7 points per game. 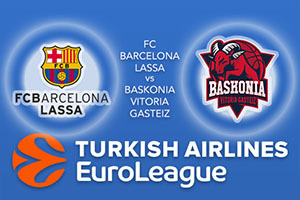 Take Barcelona at -5.5 at odds of 1.90 for this Friday night Euroleague clash. For the Over/Under market, go UNDER 153.0 at odds of 1.90. Bet Now!